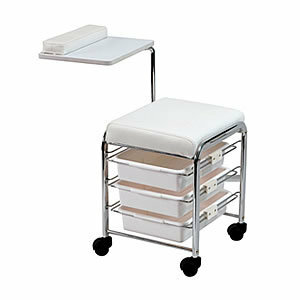 A compact and useful white manicure unit with a comfortable padded seat and 3 sliding drawers underneath. This unit comes with a handy table top and wrist pad on a chrome pole which enables the table top to swing to various positions. On 4 castors for ease of mobility. Dimensions: Height 65-72cm, seat Height 46cm, Length 38.5cm, Width 33cm.